Show us how Aero you can get. Enter the Endura Drag2Zero Aero world and join our Time Trial Challenge close to Petra. The fastest activity upload of the week will win an Endura Aero Jersey. Amongst all weekly participants we raffle one Endura ProSL jersey per week. Extra treat for all participants: after completing the challenge we offer you a free coffee at the main square of Petra, just register at our Endura PopUp store (Carrer de Manacor, 43, Petra). 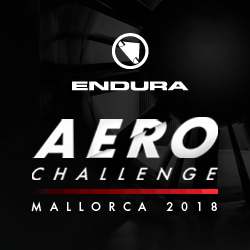 - The digital Endura Aero Challenge Badge - A voucher for a coffee in Petra at the Endura PopUp store on the main square of Petra - Weekly prices for the fastest segment activity and a raffle amongst all weekly challenge participants "
The Challenge starts on Monday 19/03 and ends on Sunday 29/04. Coffee voucers limited for the first 1000 participants, everyone who takes part in the challenge is in the weekly raffle for the Endura ProSL Jersey, the fastest run on top of the weekly leaderboard will win the Endura Aero Jersey.